When monitoring SSAS we can use a few tools to gain insight into what is happening on the instance. Perfmon is especially interesting as it shows us information about various aspects of the server – we can see memory, disk, CPU and MDX counters out of the box. However, perfmon cannot show us how many queries were run on SSAS – neither per period (e.g. second), nor in total since the service had started. We have another counter, similar to a count of queries – Storage Engine Query : Total Queries Answered. This is not the same as the number of MDX queries answered, as if a query does not hit the Storage Engine (SE), but the Formula Engine (FE) cache instead, it won’t increment the counter. And, if a query needs to be answered by more than one Storage Engine requests, we will see that the counter gets incremented with more than 1. Unfortunately (for us in this case), since the Query Log is typically used for Usage Based Optimisations (UBO), it also shows SE requests, not the actual MDX queries issued. Hence, it suffers from the same drawback as the perfmon Total Queries Answered counter. The other alternative which comes to mind is SQL Server Profiler. After all it allows us to see what queries get sent to the server, along with lots of other useful information. If we are interested in the count of queries only, we can capture a trace which includes only the Query End event. Why not Query Begin? Well, we can’t see some possibly interesting numbers before the query has been executed, for example the Duration of each query. If we capture only Query End we get exactly what we need – one event per query. We can also capture Error events to check if things go wrong. As we can see above, we get the actual query in the TextData column, the User Name, Application Name, Duration, Database Name – all very useful properties if we want to analyse the load and the performance of our server and various solutions. While the information looks great on screen, having it in a database table would enable us to do what we (BI devs) like doing – play with the data. Only this time it’s our data, about our toys, so it (at least for me) is twice as fun. A SSAS trace can be run on the server without Profiler – the term for it is a “server-side trace”. Unlike SQL Server RDBMS traces, a SSAS server-side trace cannot directly log its output to a SQL Server table. Luckily, we can write the results in a “.trc” file, which in turn can be imported into a SQL Server table with a few lines of code. Now, armed with all these scripts we can effectively manage traces on our instances. The only problem we have not resolved so far is exporting the trc file created by our create trace XMLA command to a database table. This can be easily done in a .NET app, or in PowerShell. The ps_trace_copy_to_table.ps1 PowerShell script does the following (thanks to Darren Gosbell for creating the initial version). We delete->create the trace because otherwise we cannot delete the trace file. The last step runs a stored procedure which moves the data from the table we imported into to another table because the first (landing) table gets re-created every time we import into it and the trace data cannot persist in it. Note that there is some exception handling implemented in this script (try/catch/finally blocks). If you are using an old version of PowerShell, it is possible that you may have to remove the exception handling statements as they were not supported. I have attached a sample script which excludes them (ps_trace_copy_to_table_no_exception_handling.ps1). Finally, we can run this script through SQL Server Agent on regular intervals. SQL Server Agent allows direct PowerShell script execution, so this is very easy to set up and can be scheduled to run recurrently every X minutes/hours/days. A small note: you may notice that some rows in the database table contain events with an Event Class <> 10 (10 is Query End) and NULLs in most columns. These are trace-related events and can be ignored (e.g. your stored procedure moving the data form one table to another can skip such rows). There is also another way to achieve the same outcome. As a part of the Microsoft SQL Server samples you can download a utility called ASTrace. You will have to download and compile it, but after that you can run it as a Windows service and it will capture the trace events as they happen and write them directly to a SQL table. The Server -> File -> Table changes to Server -> Table. Also, you don’t need to move the data from one table to another. The drawback is that you have an additional service on your server. You may or may not be able to run it (depending on your organisation’s security policies and admin practices), and while it is open source, it is not officially supported by Microsoft. Great post Boyan, enjoyed reading it. Could you please clarify me on one thing about this post.Sorry i didn’t get the reason why u have imported trace into a XMLA command and later populated the data into a table. we can directly export the Profiler trace to a SQL table right . Could you please tell me the reason why u did in that way . You can do it with a SQL Server RDBMS trace, but not with a SSAS one. When we are running sql profiler by connecting analysis service , after the trace was run we have an option to save the trace to a table in sqlserver . That is present in File>Save AS > Trace Table . 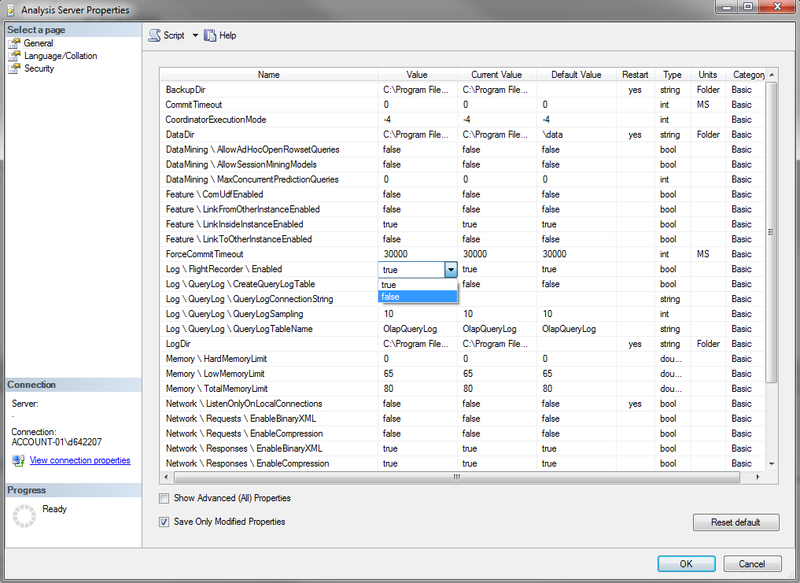 After saving data into a table in sqlserver , it would contain all the columns what profiler has shown to us in trace. I hope u are also taking about the same thing . Please correct me if i am in wrong direction . How do we automate this then? So we don’t have to manually save to a table?? Boyan!! I have a question for the MDX masters!! How to emulate Aggregation Type = None, when using Standard Edition?? Next Next post: Is Excel 2013 Power View hurting SSAS?